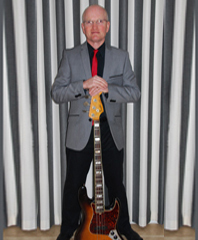 Steve started playing music at 15, but was 18 before he joined his first band Fizzer. At 21 he joined funk/soul band Mr Right. After this, Steve became a studio engineer somewhere in Greater London. Two years later, he joined Sax Maniax while also playing in ska-revival band, the Ska-dows. While in The Retros, Steve also played in a band called "Itchy Fish ".